I know this seems like a simple post (and I’m sure some of you think it’s a cop-out ’cause I’ve had emails with people telling me my pizza recipes are cop-outs, haha) but you won’t believe the number of requests I get on roasting potatoes and what our favorite way to roast potatoes is. 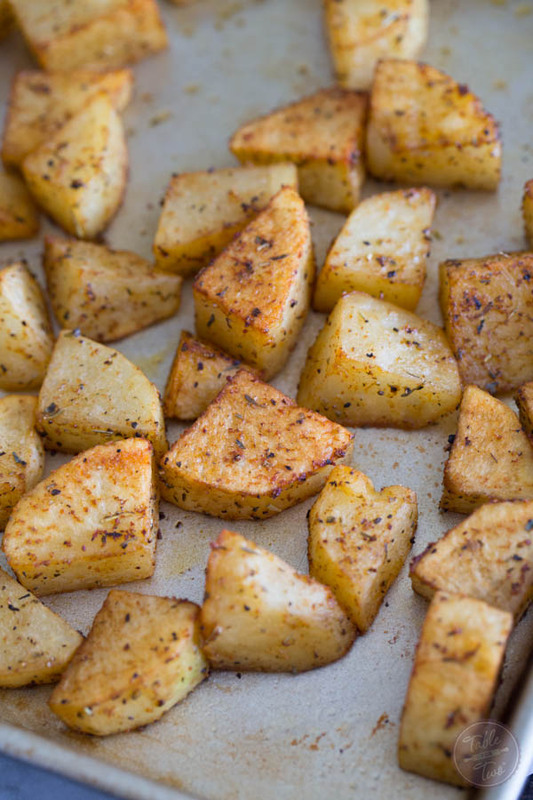 Our favorite way to roast potatoes, specifically with russet potatoes. Jason loves this seasoning blend that I use and quite frankly, I do too! Sometimes a simple potato recipe is all you need. Nothing needs to be too fancy! How do you get a crispy exterior? High temperature is your friend. The oil on the potato’s exterior will crisp it up. You want that crispy exterior so don’t be afraid to use a higher temperature. Do you have to use a russet potato? No, you could virtually use any potato and use the same seasoning blend. How do you know when the potatoes are done? When you can stick a fork into it and easily slide it in and out, it’s done! This may be because of how thick you cut them. If they aren’t cooked through at the end of baking time, let them cook longer. 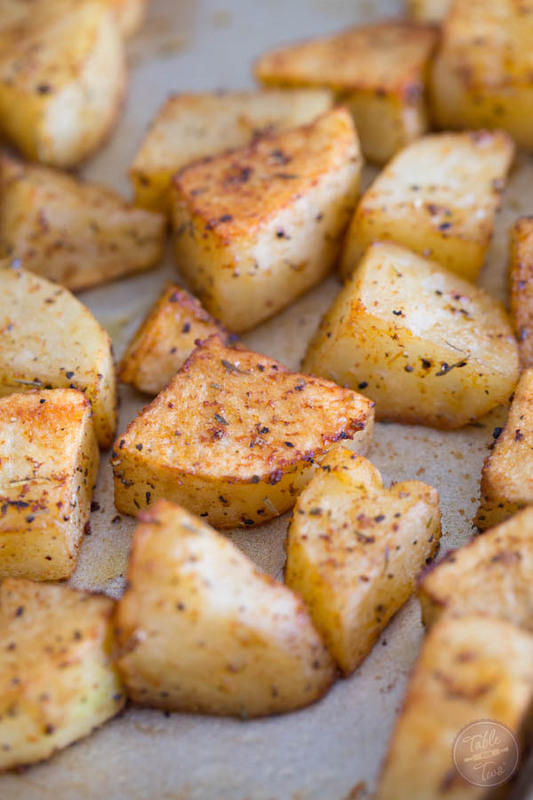 Our favorite way to roast potatoes with the easiest seasonings! Preheat oven to 425 degrees Fahrenheit and lightly spray a baking sheet with cooking spray. In a large bowl, toss together potatoes oil, and seasoning. Pour potatoes onto baking sheet in an even layer. Bake on the middle rack in the oven for 25-30 minutes or until potatoes are tender. Flip the potatoes halfway through the cooking process. I love roast potatoes! 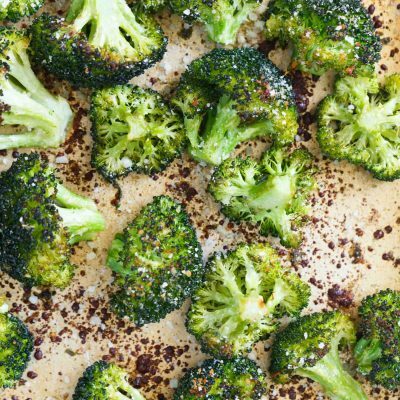 We normally just do ours plain in oil or duck/goose fat with a little salt and pepper but love the idea of using a seasoning blend like this! We love roasted potatoes and C begs me to make them at least twice a week. I’m going to have to try your method next time I do – they look fabulous, Julie! 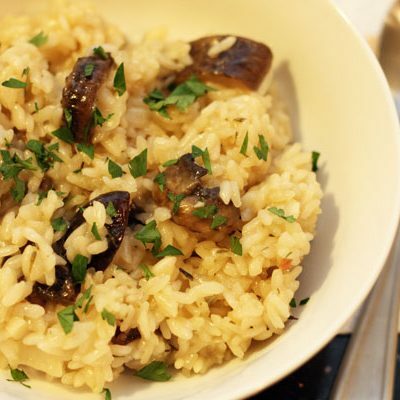 Sometimes it’s the simple recipes that hit the spot! This is the best way to roast potatoes and there’s no substitute for olive oil and good seasoning! Thanks for sharing, Julie! I love that you talked about Game of Thrones today! So pumped for Sunday. Also, those potatoes, totally making!! We eat a lot of roasted potatoes….various kinds. They are great, quick and versatile. 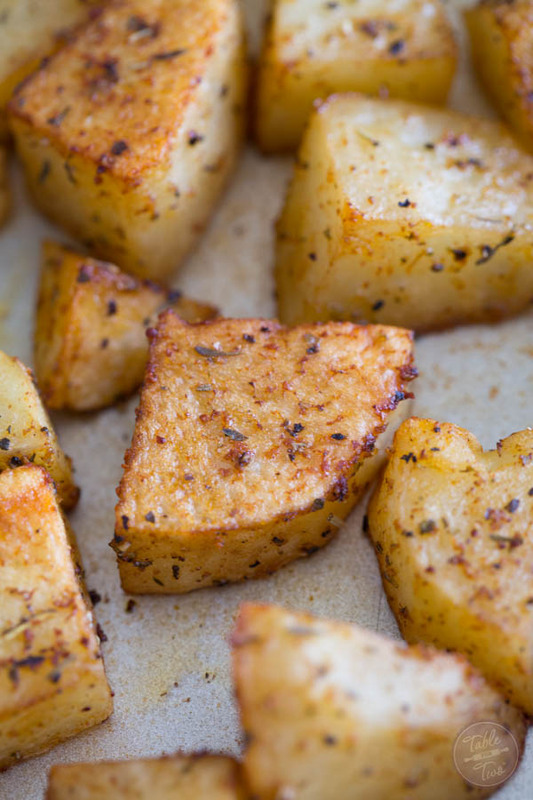 Who doesn’t love a good roasted potato recipe?? And that crisp exterior-a must. I make roasted potatoes frequently especially with our roasted leg of lamb for Easter. The only addition I make is to add a lot of lemon juice and chopped garlic instead of garlic powder. Our grandchildren love them too. These look great. Not sure how to make those cute wedges like in your photos. They look so small. Did you first slice the potatoes lengthwise, then quarter them? Also, much easier and very flavor-ful to use only Lawry’s seasoning salt. Only “spice” we use on our potatoes. I sliced the potato in half (not lengthwise, the shorter side) then in half again and then diced them into quarters. When you say you cut in half (got it), then half again, are you flopping the two sides down flat & slicing each half not lengthwise again? I always cut too big of chunks and it takes forever to cook! Yes, so after the second halve…you put the flat sides of the potato down on the cutting board. Then I slice in half lengthwise and then I quarter them. Does that make sense? I might take a photo of this this weekend to be more clear. So if you want to come back for a step by step, I’ll try to have it up by the end of the weekend! 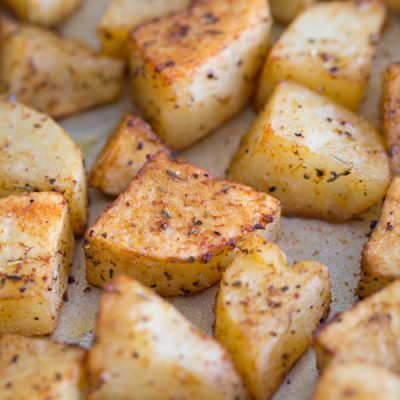 Roasted potatoes are always a favorite, love your recipe! What a great way to enjoy some potatoes! Oh yum! These roasted potatoes look delightful!! Roasted potatoes are definitely my favorite way to eat potatoes. This seasoning looks delicious. My boyfriend and I went to see the last two episodes of GOT in IMAX and let me tell you…it was AWESOME! I can’t wait for Sunday. Roasted Potatoes are a must at our house. I use a similar recipe to this and it’s always perfect. These potatoes look super delicious! Those look so crispy and perfect! I love all the seasonings on each piece :) And OMG I’m the same way at the TV. It’s so annoying; I wish I could jump in there and slap some characters, ha! these look awesome and I am a total GOT psycho and can’t wait!!! I actually made some roasted potatoes tonight, but my favorite seasoning to use is Trader Joe’s 21 Seasoning Salute. Yum! I made these once and my husband now asks for them all the time. I have made them for dinner and breakfast. Great recipe! Thanks. I tried this recipe last night to go with a new fish recipe. Sometimes you need a litte inspiration even when it comes to bringing things back to basics as this recipe does. Well, these potatoes saved the night! The fish recipe was complicated and a little dissapointing. However we loved the potatoes! Thanks for your recipe. Thanks for the great recipe! Perfectly seasoned and delicious. Growing up, whenever my mom made oven roasted potatoes, it was always red potatoes mixed with a little olive oil and a packet of onion soup mix. I loved it, but this sounds like a simpler tastier version of that. This was so easy to make. I had some blood orange infused olive oil and decided to use it instead of the regular olive oil and it was delicious. Thank you for the recipe idea. So delicious! Needed a quick and easy side for dinner tonight and this was it! Enjoyed by all. Thank you for sharing! how early can I peel and cut potatoes, guests coming @ 6 tonight? Olive oil Old Bay perfection! I found the quartering answer in other notes on your website. I haven’t made this yet, but it does look simple and good. However, can you roast the potatoes with the skins on? 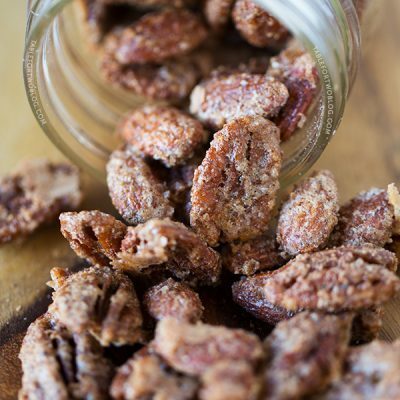 There are so many good-for-you nutrients in the skins I prefer to keep them on. And a totally unrelated to cooking question: do you have/did you have a relative who was an astronomy professor back in the early 70’s? I attended UC Santa Cruz and had a class with a Professor Joseph Wampler. I really liked him and it was a great class. I will also be considering buying your cookbook—finding recipes for two people (just me and my husband) can be difficult! Yes, absolutely!! We keep the skin on for baby fingerlings and whatnot so definitely keep skin on if you want! And no, haha – Wampler is my married name! I don’t believe my husband’s side of the family had an astronomy professor though!